Kentucky’s weather has a particularly unrelenting way about it when it comes to aging distillate. With the temperature extremes in that searing, hot, humid, hell like state, a multi story rackhouse does not need much time to perfect a fine bourbon. When temperature goes up, whiskey expands, forcing itself in the oak to those wonderful caramelized layers under the char, picking up all sorts of vanilla goodness. As temperatures goes down, whiskey contracts. This process typically plays out in no more than 6-8 years, as the whiskey has taken on a majority of its flavor from the barrel and is ready to go for bottling. Too long and the bourbon becomes too tannic and over oaked for its own good. For this reason, we do not see many bourbons bottled past this typical aging period, but when we do, and it’s done well, you’re taken to a new level of flavor development. Elijah Craig is one of the few brands that can successfully pull this off. Another is Pappy Van Winkle, but no one cares. Elijah Craig 18 Single Barrel used to be a near constant on the shelf up until about 3 years ago when it was replaced by older bottlings, a “temporary” move by Heaven Hill Distilleries. A 20 year old was released in 2012 to much acclaim and premium price tag (oh, that’s why they did it). Because the older age statement bottlings were never going to be a permanent fixture, there are rumours that EC 18 will be returning to our cabinets in 2015. And it looks like EC 18 was recently confirmed to be on the shelves in the fall of 2015 as a regular release. I bought my last bottle for $50.00. Price is now at least $120.00. And because none of us are rich dentists, it has been priced outside of our normal acceptable range. If you price bourbon like scotch, you will suffer their current fate, which is slowing sales and category momentum. Good luck with it. 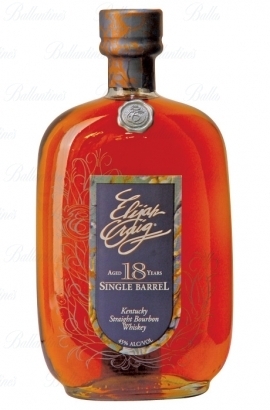 Elijah Craig 18 is a rye based single barrel Kentucky Straight that, by its nature, makes traditional interpretations of bourbon flavor hard to generate. The developed notes of leather, musty shed, mossy oak and thick texture propel EC 18 in a class of its own, to use a tired phrase. Our club sampled this blind, just to see what would happen. But just like I thought, we agreed with Chuck Cowdery in his assessment: “Few bourbons demand so much from the drinker and fewer reward the effort so richly.” Let’s get to it. Nose- One of a kind nose. Musty, old oak and dark cherry. Dry, dusty spice notes, dark chocolate and coffee. Eucalyptus and clove. Thick. Time and water brings out vanilla sweetness and blackberry. Leather. Wow. Taste- Dark fruits with chocolate. Vanilla and oak. Thick and viscous. Excellent mouth feel. Savory spices. Finish- Charred oak, dry and musty. Some fruits, barely sweet. Medium length. Comments- What an intriguing pour. Strange flavor profile but this “old soul” of a bourbon has 18 years of interesting things to say with every sip. We hope EC 18 comes back soon. Very much recommended, but take your time with this one. Agree Disagree? Let us know in the comments sections below.